Budget friendly bags for lightweight speed and travel are hard to come by without a little know-how and a lot of research, after all sometimes ‘budget friendly’ solutions can end up leaving you with half-life suitcases. Lucas Luggage and IT Luggage are two of the top brands for affordable lightweight luggage made from durable long-lasting materials. For the most part we’ll let you decide which is better for yourself, after all the traveler usually knows what bag will suit their needs. 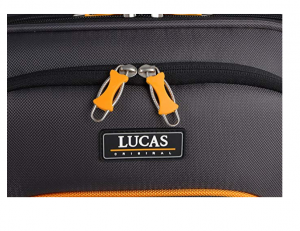 However, there are clearly pros and cons with either brand; in our review we’ve considered all elements which count in weighing Lucas Luggage against IT Luggage. IT Luggage or Lucas Luggage? In comparing these brands, we organized the following review into segments which compares the best models from Lucas and IT in the following categories: Suitcase Storage, Materials/Durability, Additional Features and Size/Style Options. 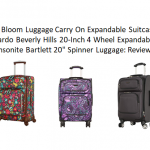 It’s our belief that with these suitcases side by side any reader will be able to choose for themselves the best suitcase for their needs, or just choose overall the best brand based on how the features compare and which brand clearly shows up on top. The Lucas brand is synonymous with expandable lightweight bags for business trips and weekend getaways. They’ve also expanded to include larger checked bags for any extended length of travel. Their overall goal is to provide affordable lightweight bags with innovative designs made from high-quality materials, and when it comes down to their carry-on suitcases the Luggage Air Cube is a customer favorite with fantastic design features that include 4 spinner wheels for a truly advanced multidirectional movement system, as well as a structured shape and an ergonomic telescopic handle. Also, when it comes down to Lucas Luggage vs. IT luggage, nothing can beat the extra points this carry-on offers with its unique wide-body design. 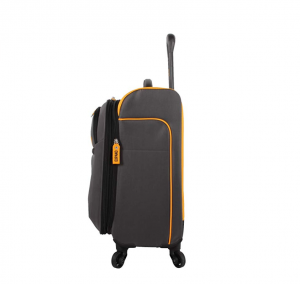 As stated, this suitcase has a body designed to be wider than most carry-on suitcases of the same size, but this isn’t its only added storage feature; this suitcase also comes with an expansion zipper for up to 2-inches of additional packing space (or 15% more space when expanded). Other storage perks come in the form of an interior zippered pocket as well as tie down straps. Exterior extras offer two front face pockets, one which is double the depth of the first. For your business trip or short getaway, this suitcase can easily fit between 3-4 days of packed clothing + shoes and toiletries. 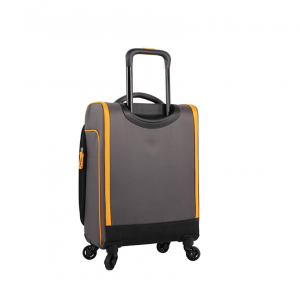 Suitcase features a durable cotton canvas design which offers more durability than your average polyester suitcase, but less than more expensive nylon designs. 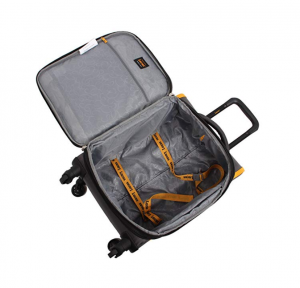 Other durability bonuses include wheels which are screwed into the frame of the suitcase rather than riveted, a telescopic handle made from sturdy aircraft-grade aluminum, and long zipper pulls which will preserve the life of your zippers. Also, in the odd event of any unlikely breaks or tears due to manufacturer error, this brand offers a great 10-year warranty with purchase. The comfort grip, one-touch telescopic handle allows for impressive precision handling and adds to the mobility of the 4-wheel design. The interior of the suitcase is spacious, fully lined and water tight, and offers two tie-down straps for creating even more space. 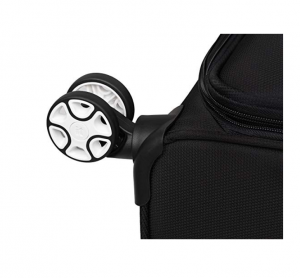 Other design specifics include a top haul handle along with two side-haul handles to make taking your suitcase down from an overhead bin both easier, safer, and better on your back no matter your age. This suitcase measures in at 22.8 X 14 X 9 inches and weighs 5.8 pounds unpacked – the weight is very impressive for a carry-on of this size, especially considering that most under-seat designs that are smaller at 14-16 inches typically weight just as much and sometimes even more. Dimensions do not include the 2-inch added width when expanded. Style options, unfortunately, are limited to the basic grey with orange lining. Where it comes down to storage, this IT original matches pretty evenly with the Lucas Luggage Carry-On; they both feature a wide body design, and this IT 22-inch suitcase also expands up to an additional 2 inches for 15% more packing capacity. On the exterior you get added storage from two outside pockets, the bottom zippered pocket which is double the length of the top. Interiors are where the Lucas carry-on and IT carry-on differ, with IT’s suitcase offering two pockets – one zippered and the other being a stretch shoe pocket. 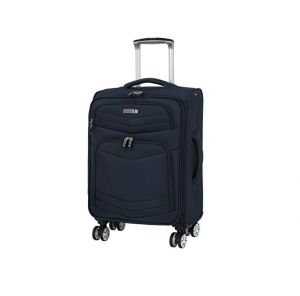 Likewise, it comes down to a tie when we’re comparing materials in the question of Lucas Luggage vs IT luggage; both suitcases use a highly durable cotton canvas exterior which creates necessary outer padding to rebuff damage from drops/etcetera. 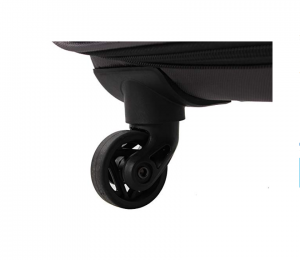 Other durability features include a thick inner polyester lining that’s quite water tight, a telescopic aluminum handle which doesn’t shake and extends smoothly, as well as an 8-wheel design which is – arguably – more durable than Lucas’s 4-wheel spinner design. 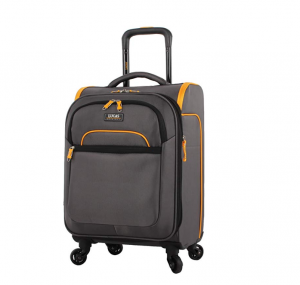 A full work up of this suitcase’s extra’s includes zippers with long durable zipper pulls, a fully lined interior, excellent spinner wheels which offer added mobility and strength on an 8-wheel system, a telescopic push-button handle, plenty of extra exterior and interior pockets, and finally a zippered expansion for up to 2 inches of additional packing space. All in all, for a carry-on item that’s rigorously tested to meet the space requirements of all national and international overhead bins, you couldn’t want for any other extras. The final dimensions for this suitcase measure in at 22 x 14 x 9 inches and only weigh 5.95 total pounds unpacked (again, another impressive weight considering this is a carry-on suitcase). 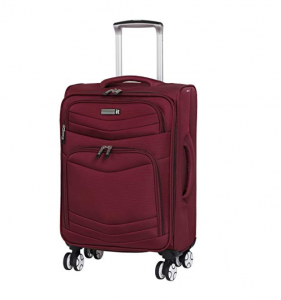 When it comes down to it, the one thing this suitcase has to offer that Lucas luggage did not have, is a more extensive list of style options (up to 5 semi-basic choices) our favorites being Dark Red and Potent Purple. Overall, the look of these suitcases is business formal and strikes a very metrosexual look so that these bags are a great choice for any traveler on any type of travel be it business or pleasure. In conclusion, put simply, it is hard to choose between these two brands on just their carry-on’s alone. 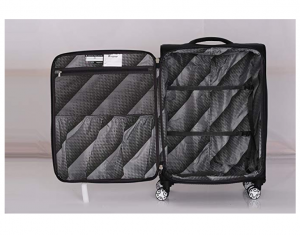 The design specifics of their storage capacity and overall durability are neck in neck, making both of these suitcases excellent travel options for packing lots of belongings and keeping them protected. 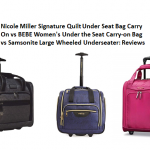 Where differences do count, other differences pretty much bring these brands back to equal ground – for instance, although IT luggage has more style options for their carry-on, Lucas Luggage offers a much more affordable suitcase. In the end, the final decision comes down to your personal needs as a traveler, because in this brand review these competitors have clearly given their design’s every bit of attention to create truly great carry-on items that can’t be beat, even by each other.